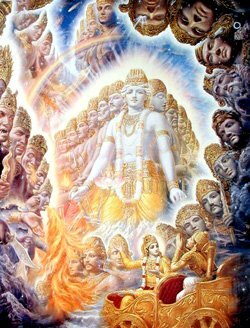 Attainment of the Supreme (Gita) | eWakening now! Physical nature is known to be endlessly mutable. The universe is the cosmic form of the Supreme Lord, and I am that Lord represented as the Supersoul, dwelling in the heart of every embodied being. Whoever, at the time of death, quits his body, remembering Me alone, at once attains My nature. Of this there is no doubt. This entry was posted on March 25, 2009 at 5:46 pm and is filed under enlightenment, god, hinduism. You can follow any responses to this entry through the RSS 2.0 feed. You can leave a response, or trackback from your own site.